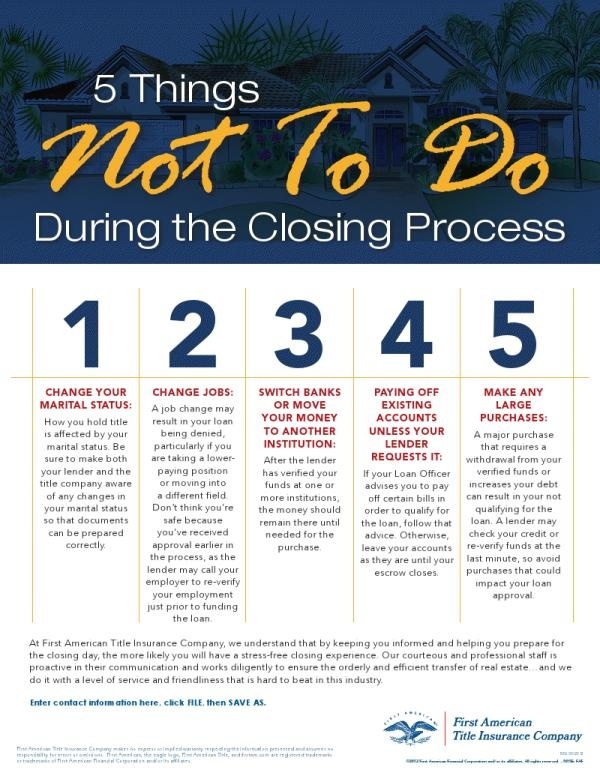 Mortgages By Linda | 5 Things To NOT DO During The Home Loan Process! We’ve all be there – We are ready to buy a home and start the somewhat daunting process. We have the perfect realtor, approved with a lender (of course Mortgages By Linda!) and accepted offer on that dream home. Everything is going as planned however, life moves forward and changes, good ones, present themselves. A job promotion (which means a title change), a car deal to good to pass up or the living room set of your dreams is on sale…a HUGE sale. Things that are “icing” to your home cake. This is what we call the “home-buyers” glow! The point in the process where everything is on track and the dream of the new home is almost complete and buyers get restless with life. They want to make big decisions that would normally seem acceptable but can IMPACT their financial situation dramatically. Team Mortgages By Linda prides itself in clear communication from the beginning on things to NOT DO during the process of obtaining their home loan. Even if we get the 3 sweetest words in real estate, “Clear To Close”, buyers should not adjust their financial status in ANY WAY as it can impact the closing.